Growing up in Australia, Elizabeth was always an active child. However when she got older and went to university, her active lifestyle took a back seat and her university degree was her main priority. After finishing her law degree and landing a job in Hong Kong, Elizabeth rediscovered her passion for sports. 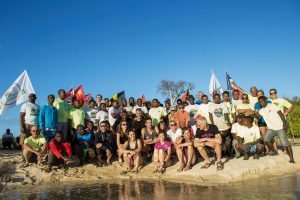 “Sports is a way to connect with others and meet new people,” she recounts. Every Wednesday evening she meets up with her friends, equipped with head torches and hydration packs, they run the trails over Hong Kong Island. 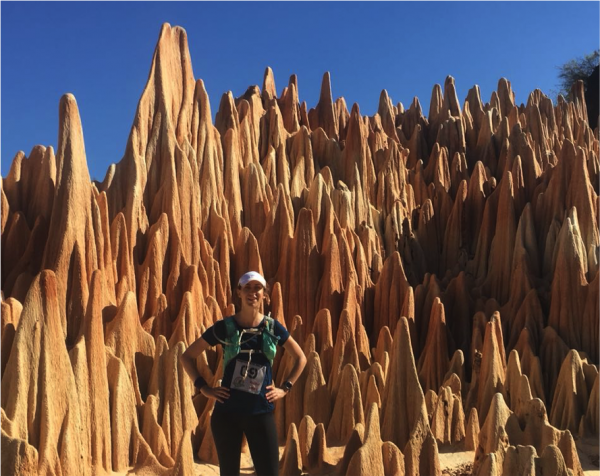 With such versatile terrain it is the perfect place to train for an ultra-marathon, but what was the main deciding factor that made Elizabeth actually run it? After listening to Elizabeth recall all the things that had happened before her decision to run an ultra-marathon in July this year, it was clear to me that there was not one main deciding factor. Rather, it was a sequence of events that happened to fall into place, along with Elizabeth’s determined mind-set. It started with the running group she had joined known as “TWINS”, and later at a WISE event where she had met Mo-Yee, who was an ultra-marathon runner herself and would later become a mentor for Elizabeth. As runners in this group had run ultras-marathons before, Elizabeth had already been exposed to the community in Hong Kong. “But why Madagascar?” I asked. It turns out, there are many reasons why. 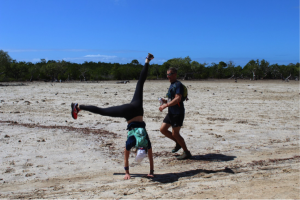 Elizabeth heard a number of people in her trail running group talk with huge enthusiasm about all these amazing experiences they were having competing in ultra-marathons in some of the most exotic places you can image. One discussion that stood out for her was from Mo-Yee at a WISE event, who spoke of an ultra-marathon she participated in in Madagascar several years ago. As they both work in similar industries and love running, Elizabeth thought to herself “if she can do it so can I”. But this still didn’t answer, of all places, why Madagascar? I felt this sense of wanderlust, a burning desire to see and experience different aspects of the world that most people would never get a chance to experience. It quickly became clear that this wasn’t just about the race, it was about the whole experience. The adventure she was going to have while running. The amazing out of this world scenery she would witness during the race. The incredible stories that would eventuate from this journey. 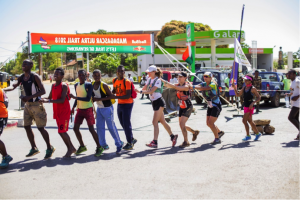 The only problem was that the race was 150km long and only 3 months away, not to mention Elizabeth had never run more than 21km in her lifetime. Luckily she sought help and advice from Mo-Yee and another experienced endurance runner, Derek Kwik. Although Elizabeth’s time for training was rather short, she decided to make the most of it. She learnt about hydration and energy levels and how to keep them high when running for prolonged periods of time. She travelled and trained in different places like Taiwan (running through Taroko National Park) and Saipan. However, finding the balance between her full-time job and training was challenging. Most days she would work all day, go for a 15km run in the evening, refuel her body with food, head to bed, only to wake up and repeat it the next day. I couldn’t help but wonder what Elizabeth’s colleagues or friends thought about her deciding to run 150km in 3 months time. 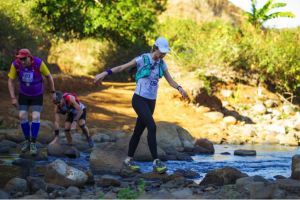 As Elizabeth works in a mostly male dominated industry, she found it surprising this ultra-marathon had given her quiet acknowledgement from her colleagues, friends, and fellow athletes. Something she hadn’t expected. 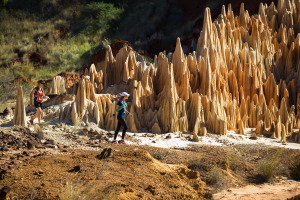 The Madagascar Ultra Trail is a 150km race over 6 days. From day 1 to day 6, the run is split over: 22.2km, 25.6km, 27.8km, 42km (a full marathon), 28km and 8.8km respectively. There were only 20 participants in the whole race. Starting the race, Elizabeth decided she would find someone to keep pace with and found a father and daughter duo. It was times like this where Elizabeth felt that even though running is individual, you’re never truly alone. Both these days were fairly straightforward for Elizabeth, except for the endless amount of sand that she had to run through, which was mind numbingly painful to do. 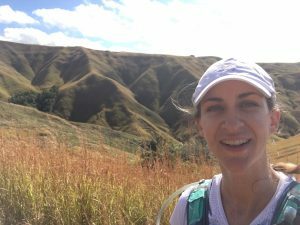 She appreciated the fact that this was a once in a lifetime experience to be able to run through such rural and remote parts of a country and see such a different way of life in comparison to the fast paced life of Hong Kong. Elizabeth recalls how unbelievable it was that she had run through villages where residents had never seen Caucasians before. These villages were in the most remote parts of the country, and here they were running through them as part of the race. On day 3 Elizabeth started to feel sick, perhaps due to lack of hydration and exhaustion and then on day 4, all hell broke loose. Elizabeth woke up that morning feeling incredibly nauseous, dizzy and very weak. The signs of dehydration. At the start line she started vomiting; but the worst part was that she hid it, because if any run officials found out, they would pull her out of the race. Elizabeth was definitely not going to let that happen. This was also the day that her IT band started giving her trouble, but by the time she realised this the Medical team had already left, so she had asked a fellow runner to quickly help her tape up before starting. Throughout the day most of the terrain was mud and wetlands. There were 25 river crossings. She now understood why people brought expensive trail running shoes because of their quick drying material. So much for Decathlon! Not only was she now walking 42km because of her IT band, but she now had to do it all in wet shoes as well. Elizabeth had aimed to finish that day in 6 hours but in the end finished in 8.5 hours, just before the cut off time. What amazes me the most about this day is that even at her lowest, when anyone would have given up, for Elizabeth she had come too far to quit and so she kept on going. Day 5 was a turning point for most of the competitors because they realised it was soon coming to an end. In the days before they had really bonded and experienced things that words will never be able to do justice. Even with Elizabeth’s aggravating knee, she was still able finish the race. At the finish line the Madagascan Paralympic team joined the runners in a parade through the town. I have to agree with Elizabeth, when I first heard that she was running in such a small race, I thought to myself why? It’s so remote, and not well known. But the more I listened to her stories of the people she met during the race, and how even such a small event can impact so many local communities and create more opportunities for their people. I realized how sometimes, small events can be more impactful then the larger ones. Through this experience I think I learnt how important goal setting really is, it helped me find something I am passionate about. Goal setting is an important aspect in our day to day lives, and also in our sporting lives. Elizabeth discovered setting smaller goals is just as important as setting the big ones. By the time Elizabeth returned to Hong Kong, she had never felt so strong. “I remember going to a yoga class, and realising how strong my muscles are.” It was clear that it wasn’t only her muscles that had become stronger, her character and confidence had also been enhanced. Through this experience she had rediscovered her passion. Working towards a goal and actually completing it made Elizabeth realise how capable she is of achieving what she sets out to do. This piece was written by Ela Howard. Thanks to Elizabeth for sharing her story!